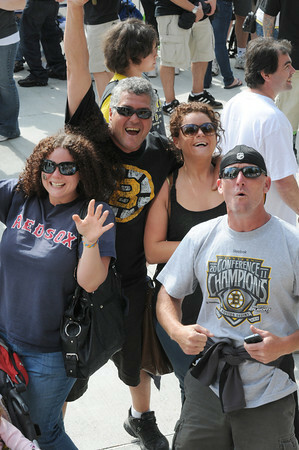 Boston: Long time Bruins fan Sam (Sammo) Frontiero of Gloucester center celebrates his birthday with daughters Samantha left and Monique right and Mike Stevens at the Bruins Victory parade held Saturday in Boston. Desi Smith/Gloucester Daily Times. June 18,2011.